At least one of three made it. We've been posting pics of the same clump of crocus going back a bunch of years. 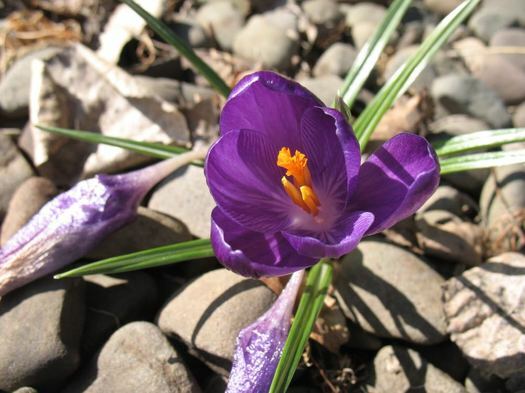 When the crocus blooms, it's sort of like an unofficial sign that spring has arrived. But this year... well, this year was weird. This crocus started to poke through the dirt and rocks in February. And then, after the stretch of strangely warm weather in the early March, it was just about to bloom when the cold snapped back. The curled up blooms stood there, waiting. Then the crocus was buried in two feet of snow. And after the melt... the almost-blooms lay slack. Then, today, during the sunny afternoon: A bloom appeared. Spring really is here. Again. Or something. By the way, the previous crocus bloom dates: March 11 (2016), April 13 (2015), March 19 (2012), April 11 (2011), and March 17 (2010).